No one would mistake Marquette's Front Street for the Magnificent Mile in Chicago. There's only so much foot traffic retailers are going to see in this city of 21,000 on the southern shore of Lake Superior. Two Marquette retailers, though, have found ways to thrive both as a "brick and mortar" shop for their hometown -- and as an online retailer, with customers across the continent. 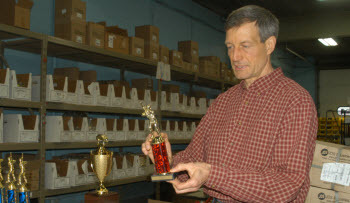 QuickTrophy, whose Marquette building is barely a block away from Lake Superior, is using the Web to market trophies, medals and plaques around the country. Getz's Clothing Store, about 10 blocks away in downtown Marquette, is one of the top distributors of Carhartt clothing in the United States. The two businesses are succeeding in the 21st century balancing act of being local and digital. QuickTrophy President Terry Dehring grew up in Alpena and attended Northern Michigan University in Marquette before moving to Madison, Wisc. However, life in the Wisconsin capital didn't completely suit Dehring and his wife Anne. "The whole time we were living in Madison, it never felt like home. We kept wanting to move back home," Dehring said. So, in 2000, Dehring and two business partners -- Stephen Polk and Mike Kane, both of whom live in the Detroit area -- started looking at the idea of making trophies and selling them on the Internet. In April 2001, the QuickTrophy website went live. "The biggest thing was the website," Dehring said, "making sure it was sound and making it easier for customers to use." The site, www.quicktrophy.com, now has menus covering the gamut of typical badges of success -- trophies, plaques, medals, acrylics. The process seems to work. Dehring said that so far in 2012, the firm has seen growth 30 percent to 40 percent over 2011 rates. The company now employs 17 people. Dehring said there are advantages to having a strong online business. "I know what customers are going to order, so I can stock those parts," he said. For quality control, customers put their initials on their orders, and a follow-up email is sent so they can double-check their wording. The laser engravers, Dehring explained, are tied to the computer system. "The whole place here is essentially a trophy factory, but it's very automated," he said. At nearby Getz's Clothing Store, manager Dennis Mingay said his firm's advance into the digital world began in the mid-1990s. Mingay explained the session was about the potential of the Web. Returning to his own operation, he called Carhartt. Soon thereafter, Getz's was peddling Carhartt's "work/lifestyle" attire online. Now, little more than a decade later, Getz's is the third-largest distributor of Carhartt under one roof, Mingay said. "Ever since (the initial meeting)," Mingay said, "we've taken the necessary steps to be a great online source for people." At Getz's, which also sells outdoors-oriented brands such as The North Face and Keen, 55 percent of overall business is online, with 45 percent in the store. All products are shipped from Getz's, an elevator from 1900 notwithstanding. There are about 40 employees at Getz's, but additional hires for the Christmas season -- when there can be 1,000 daily online orders -- can push the number to 55. John Spigarelli, vice president of e-commerce with Getz's, said the store reaches online customers through several methods, including a banner advertising network and marketing emails. Both online (www.getzs.com) and in-store sales have particular niches at Getz's. "Some of our best sellers don't sell well in store, and vice versa," Spigarelli said. "It gets the word out. Geographically, we're rather isolated. If you have to depend on people who only live in your locale, I'd imagine you're missing out on a lot of sales opportunities." "They could exist without each other," Spigarelli said, "but it exists much better with each other."